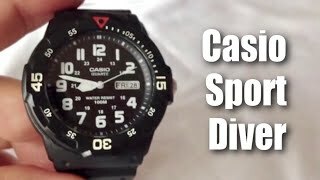 The mrw200h-7bv men s classic white dial black resin band dive watch Digital and Sports Watche is manufactured by Casio and was added around February 2018. 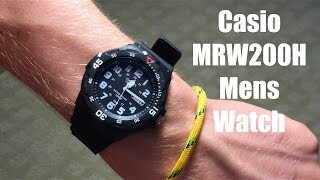 This version of the Digital and Sports Watche comes in Color : White , Special Features : Water Resistant , Special Features : Calendar , Special Features : Waterproof , Watch Shape : Other , Strap Material : Resin , Watch Type : Analog , Watch Movement : Quartz , Watch Size : 41 MM , Watch Size : 40mm to 44mm. 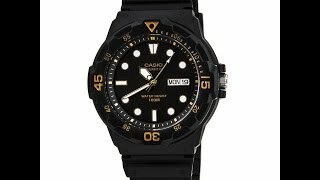 The best price for the Casio MRW200H-7BV Men s Classic in Nigeria is ₦ 11000 sold at Jumia and available with free shipping and delivery within 1-6 Days (Fashion Items) 3-8 Days for other products.